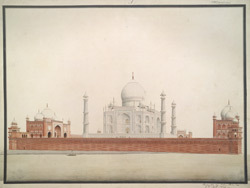 Watercolour of a general view of the Taj Mahal, Agra, by Latif, part of the Bax Collection, c.1820-1822. Inscribed on the front in English: 'The Taj Mahl (sic) at Agra'; in Persian characters; 'Raudah i Arjumand Banu Begum mukhatab Mumtaz Mahall 'amal i Latif' (The mausoleum of Arjumand Banu Begam called Mumtaz Mahal. The work of Latif). The Taj Mahal was built by the Emperor Shah Jahan (r.1628-58) for his favourite wife Arjumand Banu Begum upon her death in 1631. Constructed of India’s finest marble, quarried at Makrana near Jodhpur, it took 12 years to build involving 20,000 craftsmen from all over Asia. The tomb and accompanying buildings are organised around a garden divided into four parts by raised walkways with water channels at their centres. The pietra-dura was done with thousands of imported precious and semi-precious stones arranged in floral designs that embellish the exterior and interior of the building. The domed white marble mausoleum stands on a plinth with tapering minarets on each corner. Its harmonious proportions and exquisite craftsmanship have made the Taj Mahal one of the wonders of the world. This drawing shows the Taj from the river, showing the mosque, mausoleum and assembly hall, with a boat in the foreground.